Released in conjunction with The Fantastic Four movie, this slot game really has allowed Playtech to flex their developing muscles, much like The Thing throughout the game. Each of four super heroes, Mr Fantastic, Invisible Woman, Human Torch and The Thing feature as symbols on the game and each are animated to portray their respective superpowers, be it setting on fire or punching the screen with a strong one, two. Don’t think that this game is only well designed though because the game play itself is crisp and exciting and when a player can place a stake of up to 1000 pounds per spin, there is always going to be some excitement. There are 5 reels and 20 potential pay lines, slightly less than we have become accustomed to with Playtech but I’m going to let them off because the game is just that much fun to play. On that note….. The scatter symbol is a globe and when three or more of these are present across the reels the free game mode is activated. This feature rewards you with 12 free spins during which any of the fantastic four will appear stacked on the middle reel. Depending on which hero it is that appears on the middle reel, another special bonus feature will be triggered. If you get Mr Fantastic you can say hello to another 4 free spins and the Mr Fantastic symbol becomes an expanding wild and substitutes all other symbols, except wilds and scatters. The invisible woman mode will allow one total bet and four more free spins. Similar scenarios occur in each of the Human Torch mode and The Thing mode so you will have lots of fun trying to play all four modes and probably win quite a bit from it as well, what with the multipliers and wilds going crazy. 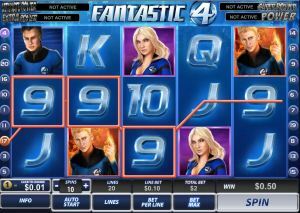 Fantastic four is a progressive jackpot slot game and because of this there is a whopping great jackpot to drool over as well. This Jackpot can be won once the Jackpot game is triggered but you can’t really do anything about this, it’s randomly triggered. There is some talk of the Jackpot game being triggered more often if you play higher stake games but we didn’t see any evidence of this. Once you are in the jackpot game you have a chance of winning one of the four jackpot levels, Power, Extra power, Super power and Ultimate power. Obviously the further up you get the higher the jackpot but you will always win at least the Power jackpot once you are in the Jackpot game. The Fantastic Four is another one of those enjoyable slots that just don’t come in a mobile version. For now, players are restricted to the online slot version. When looking for a place to play this slot, you can start by checking out 888 casino, Betfred, Ladbrokes and Paddy Power Casino. You will find this game elsewhere too – just look out for casinos that use Playtech as a supplier. The graphics and animation of The Fantastic Four slot game really are excellent. The game play isn’t all that innovative and new, most of the special features we have seen before in one form or another, but they are very cleanly developed and some really good chances of winning big money definitely make for a thrilling game experience and all round solid slot game.